When an earthquake hits, when a wildfire starts or when tornadoes come whirling through your neighborhood, some people will be ready. Others will not. No matter where you live, there is potential for natural disasters or man-made emergencies to strike. While first responders are always on the scene as quickly as possible, often they won’t be able to reach everyone affected in a timely manner. 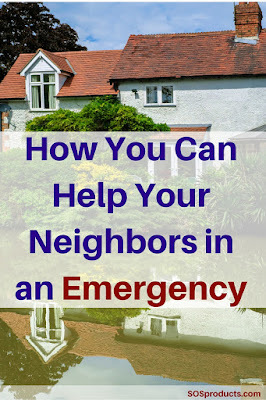 When it comes to planning your family’s emergency routine, it’s beneficial to include your neighbors and make a plan to help each other if and when the time comes. When neighbors help neighbors and communities come together, we can save more lives than ever before. The first step in learning how to help the community during an emergency is to get out there and meet your neighbors and others in the community. Find out if there’s already a neighborhood plan in place. If not, you should set a date for a first meeting to get everyone in your community together to establish a neighborhood plan. It can be difficult to establish one emergency plan for an entire neighborhood. If you’re having trouble getting people together, you can meet with your block and form a plan with fewer people, or even make a plan for just your family and direct neighbors. When it comes to emergency planning, however, remember that the more people you meet and can rely on, the more help you’ll have during an emergency. At your first meeting you should compile a neighborhood list with everyone’s contact information. It’s also important to discuss and note special skills (for instance, do you have any doctors in the area? ), discover who will need the most help (children, elderly, disabled and even pets), and decide who will check on the special needs neighbors first. Your community plan should include multiple evacuation routes and nearby meet up spots. In case you can’t evacuate, you should also discuss steps you can each take while waiting for help to arrive. Sharing shelter, transportation, emergency food and power generators can help save families money and ensure everyone has some place to go and something to eat. However, each and every home should have their own emergency kit with basic first aid supplies. It’s also important to keep solar or battery powered radios on hand so you can monitor the surrounding situation. When the power goes out or cell service goes down, two-way radios are perfect for neighborhood communication. When everyone has agreed to an emergency plan – it’s ok if it takes several meetings – it can be a good idea to conduct a neighborhood drill and hold another meeting afterward where you discuss what worked and what didn’t. You can incentivize people to participate by turning it into a fun, social event with food and drinks. Not only is creating an emergency neighborhood plan beneficial to the entire community, but it’s also a great way to get out and get to know your neighbors. Do you have an emergency neighborhood plan in place? Let us know your best neighborhood emergency preparedness tips in the comments below!